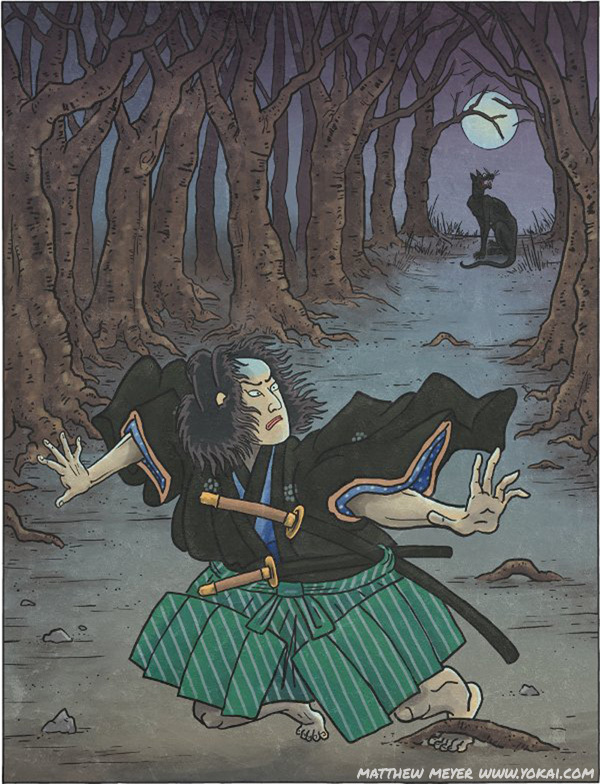 APPEARANCE: The okuri inu is a nocturnal dog- or wolf-like yokai which haunts mountain passes, forested roads, and similar locations. They resemble ordinary dogs and wolves in all but their ferocity; for their are much more dangerous than their mortal counterparts. BEHAVIOR: The okuri inu follows lone travelers late on the road at night. It stalks them, keeping a safe distance, but following footstep for footstep, as long as they keep walking. If the traveler should trip or stumble, the okuri inu will pounce on them and rip them to shreds. The “sending-off” part of its name comes from the fact that this yokai follows closely behind travelers, trailing behind them as if it were a friend sending them off on their way. The okuri inu is somewhat of a blessing and a curse. On the one hand, if one should trip and fall, it will pounce with supernatural speed and gobble him or her up. On the other hand, they are so ferocious that while they are following someone, no other dangerous yokai or wild animals will come close. As long as one keeps his footing, he is safe… but traveling in the dark over root-infested, rocky mountain footpaths, especially for merchants carrying large packs of whatever it is they are going to sell does not make for easy footing! INTERACTIONS: The okuri inu has a special relationship with another yokai, the yosuzume. This eerie bird’s nocturnal song is often a warning that an okuri inu is following you. If one hears the yosuzume’s “chi, chi, chi” song, it is a sign to take extra care to watch one’s footing so that the okuri inu doesn’t have dinner that night. In the unfortunate case that one should stumble on the road, there is one chance for survival: if you fake it so it looks like you did it on purpose, the okuri inu will be tricked into thinking you were just taking a short rest, and it won’t pursue. You do this by saying, “Dokkoisho!” (“Heave-ho!”) or, “Shindoi wa!” (“This is exhausting!”) and quickly fixing yourself into a sitting position. Sigh, sit for a bit, then continue on your way. The okuri inu will wait patiently for you. If you should make it out of the mountains safely, you should turn around and call out, “Thanks for seeing me off!” Afterwards, that okuri inu will never follow you again. Further, when you get home, you should wash your feet and leave out a dish of something for the okuri inu to show your gratitude for it watching over you. ORIGIN: Superstition related to the okuri inu are extremely old, and are found in all parts of Japan. Wolves and wild dogs have existed on the Japanese isles for as long as humans have, and the legend of the okuri inu must have originated in the mists of pre-history. 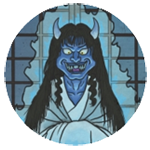 In modern Japanese, the word okuri ōkami also applies to predatory men who go after young women, pretending to be sweet and helpful but with ulterior motives. That word comes straight from this yokai. In Izu and Saitama, their is a similar yokai known as the okuri itachi. This is a weasel that works in roughly the same way as the okuri inu, only that if you take off one of your shoes and throw it at it, the weasel will eat the shoe and run away, leaving you in peace.